Lincoln’s Sparrows are wide-spread and Yellow-rumped Warblers are everywhere. A flock of 2,000+ Common Grackles was working Frelinghuysen Fields in Harding Township this morning. Autumn is burying memories of summer. Temperatures were in the high 30 Fahrenheit degree range in parts of the region this morning with a gentle frost visible on shady low-lying spots in certain areas. A Connecticut Warbler was found today at Glenhurst Meadows by Jason Denesevich. It kept company with Song, Swamp and a Lincoln’s Sparrow near Cory’s Brook. This is only the second record in 2015 of Connecticut Warbler at the usually reliable Glenhurst Meadows location. The other sighting was on a very early date of September 1. The person who found and photographed it on that date? Jason, of course. The Friends of the Great Swamp held their annual Big Sit today at the overlook on Pleasant Plains Road, Great Swamp NWR. Brave birders started at midnight and continued throughout the day. A complete list will be published in this space when available. Some notable sightings include a flyover Common Loon, Baltimore Oriole and Brant flying with Canada Geese. Thanks to Jeff Ellerbusch for the sightings report. Yours truly led a New Jersey Audubon All Things Birds field trip at Glenhurst Meadows on Oct. 10. Nine NJAS members and some extra helpers had a beautiful day to explore the meadows. No Connecticut Warblers were found but Lincoln’s and White-crowned Sparrows, Swamp Sparrows in every flavor, Nashville Warblers, 4 Bald Eagles (3 were seen over Wagner’s Farm after some participants left) are a few of the highlights. Red-headed Woodpeckers continue at Troy Meadows as seen in the photo by Chris Thomas below, Oct. 10, 2015. 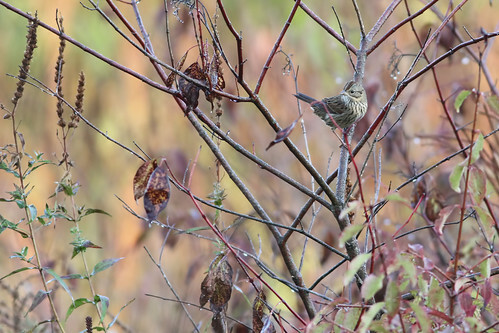 Chris also saw an American Pipit at Florham Park Fields – photo below.